This guide will walk you through the steps necessary to create and maintain infoRouter Portals. For information on infoRouter portals, visit infoRouter Portal Management. Only the “System Admistrators” can create infoRouter portals. 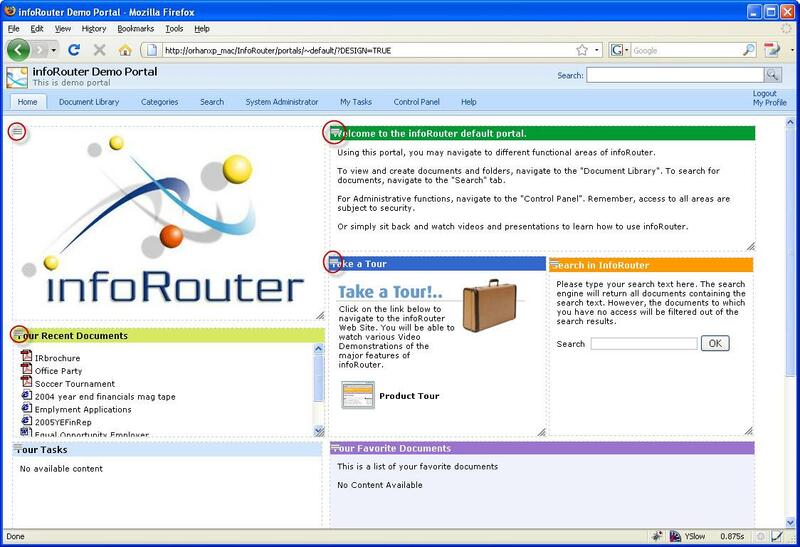 Once the portal is created, the System Administrator may assign Portal Administrators to manage the portal. Click on the “Portals” link. Click on the “New Portal” link from the tool bar. The default template that is used when creating a new portal is called “Template”. You may choose any of the available portals as your starting point by selecting it as your “Model Portal”. Enter a “Name” for the new portal. Click “Ok” to create the new portal. The System Administrator may assign “Portal Administrators” to manage the day-to-day maintenance of portals. To setup “Portal Administrators”, navigate to the portal and click on the “Management” link located on the bottom of your portal screen. Remember, this link only appears to existing Administrators and the System Administrator. Select the portal to which you wish to assign administrators. Click on the “Portal Administrators” link on the toolbar. The “Portal Administrators” window will appear. Click on the “Add Administrators” button. Select one or more users from the list that appears. Click “Ok” to add the selected users as Portal Administrators. Scroll to the bottom of the portal page and click on the “Design Mode” link. Notice that a set of new links will appear in the bottom of the portal page. When you go into the design mode, a copy of the existing portal is made. The changes you are about to make to the portal will not apply to the existing portal until you release your changes. Notice that in design mode, a properties icon appears on the upper-right corner of each gadget on the portal. Click on this icon to display the gadget properties. Each gadget has different properties you can set to achieve the desired effect. Notice that in the design mode, a new set of links appear on the bottom blue bar. Here is a list of design mode links and how they are used. Click on this link to switch to “Layout” mode. In this mode, you will be able to drag portal boxes around. You may also show or hide portal gadgets in this mode. Click on this link to display the “Add new Gadget” window. In this window, you can select from a list of built-in gadgets to add to your portal. Click on this link to Change or Edit the portal title, description and portal logo. Click on this link to add images and style sheets to your portal. Click on this link to cancel your changes to the portal. This will revert the portal back to its original state. Click on this link to overwrite the existing portal with the modified version. Click on this to go back to the main portal screen. Changing the portal layout allows you to change the position of portal gadgets around the page. It also allows you to change the size of the gadgets to fit the contents. Click on the “Change Layout” link to go into the “Layout” mode. Once in the layout mode, notice that the gadget borders will revert to a dashed style. Move your mouse to the upper-left corner of the gadget. Holding down your mouse key, you may move the gadget around the portal screen. Now move your mouse to the lower-right corner of the gadget. Holding down your mouse key, you may resize the gadget. Note: Remember, even when you choose to save the layout, the portal is not affected by your changes until you choose to “release changes”. You may add to and remove gadgets from infoRouter portals. You may also have multiple instances of the same gadget on an infoRouter portal. Click on the “Add New Gadget” link on the bottom blue bar. A pop-up window will appear displaying a list of available gadgets. Pick a gadget from the list and click on the “Ok” button to add the selected gadget to the portal. This will display the gadget properties dialog box. Every gadget will have a familiar but very different properties window. This is because each gadget has been designed to perform a different function. As with other gadget properties, you may edit the “Box Title” and make adjustments to the colors and borders of the gadget. Once you make the desired edits, click ok to add the gadget to the portal. Notice that infoRouter will try to position the gadget to an empty spot on the portal. Edit the portal header to change the portal title, description and the portal logo. The portal header also includes the tabs that appear on infoRouter portals. You may turn these tabs on and off from the portal header. Click on the “Edit Portal Header” link located on the bottom blue bar. You may also turn portal tabs on/off by checking the appropriate check boxes. Notes: You may uncheck the “Document Library” if you would like to prevent users from navigating into the document library. Similarly, you may also disable the “Member Login” control so that users cannot login to infoRouter from this portal. Every portal is assigned a set of resources when it is created. The resources of the new portal are an exact copy of the template portal or the “Model Portal” used when creating the portal. The portal resources are a collection of the portal logo, the portal css and other images used in the portal. Click on the “Portal Resources” link located on the bottom blue bar. Remove any of the unwanted portal resources by click on the “trash” icon located on the action column for each resource. To add any resources, click on the “browse” button to display the contents of your local disk. Select the resource and click on the upload button. Notice that if you choose a resource with the same name to upload, infoRouter will overwrite the existing resource with the new one. Use this option if you wish to discard the changes you have made to the portal. As indicated earlier, all changes to portals are made to a copy of the original portal so when you choose to rollback changes, the copy of the portal is simply deleted . Use this option if you wish to make your changes to the portal permanent. When you click on the “Release changes” link, located on the bottom blue bar, a pop-up window appears to confirm your choice. Notice that a checkbox with the “Reset user personalizations” label appears. In portals where “Allow Personalization” is checked, users may edit portals. Their edited versions are kept and displayed only to these users. If you choose to reset user personalizations, this action will not only create a new version of the portal, it will also force a reset of all instances of this portal that was edited by users. Use caution when selecting this option as there is no way for these users to get their versions of this portal back.